Objectives: The heart is a complex nonlinear system, whose function involves the interaction between mechanical contractions of cardiac muscles and waves of electrical excitation propagating in the heart. Heartbeats are the result of the nonlinear coupling between these electrical and mechanical functions of the heart. Cardiovascular diseases, which are often associated with heart rhythm disorders, are the leading cause of death in the Western world. A complete understanding of heart rhythm disorders requires a complex system-level approach that incorporates the interaction between electrical, chemical, and mechanical activities of the heart on a variety of biological scales: ion channels to single cells to multi-cellular tissue to organ. Given the difficulty of monitoring and controlling all these factors in the lab, mathematical modeling provides a useful tool for this purpose. The goal of this workshop is to unite researchers from different disciplines – clinicians, mathematicians, physicists, biomedical engineers, and industrial practitioners – in order to better understand the existing mathematical challenges and to explore new directions in modeling of cardiovascular dynamics. As a result of the workshop, we will identify challenges and frontiers in mathematical modeling, statistics and prediction, dynamics and control, stability analysis, as well as data acquisition and analysis for heart rhythm related diseases. We will also foster new interdisciplinary collaborations. Summary Report. This workshop reviewed models and mechanisms on spatiotemporal dynamics of cardiac arrhythmias, where a particular focus was on onset, prediction, as well as control of cardiac alternans. 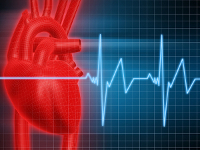 Alternans is a harbinger of ventricular fibrillation, the leading cause of death in the US. The workshop also reviewed techniques on multiscale nonlinear dynamics analysis of heart rate variability and those on characterization of surface ECG for fibrillation therapy and management. Discussions were organized into three subjects: 1) mathematical modeling of cardiac electrophysiology; 2) control of cardiac arrhythmias; and 3) clinical needs and applications of modeling and analysis tools.